It’s not entirely my fault. 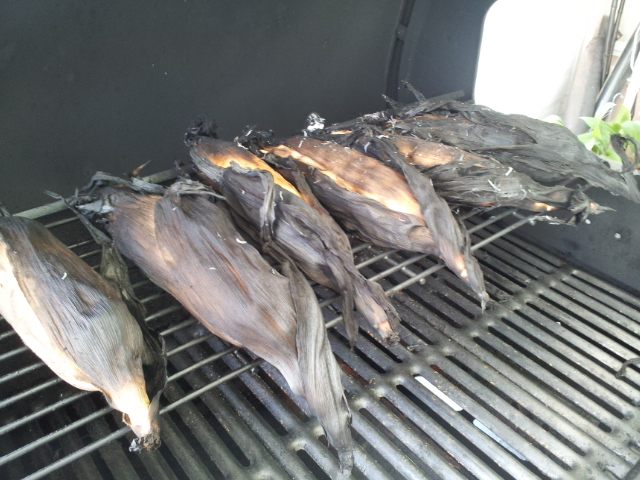 The corn was a few days old and had dried out a bit. While my mom was waiting for us to build her raised garden beds, she went ahead and planted seedlings in a few large planters. And she waited. And waited. And, while we struggled to find the time to build her beds (which we did on Mother’s Day), her seedlings producted plants that produced…..FOOD! 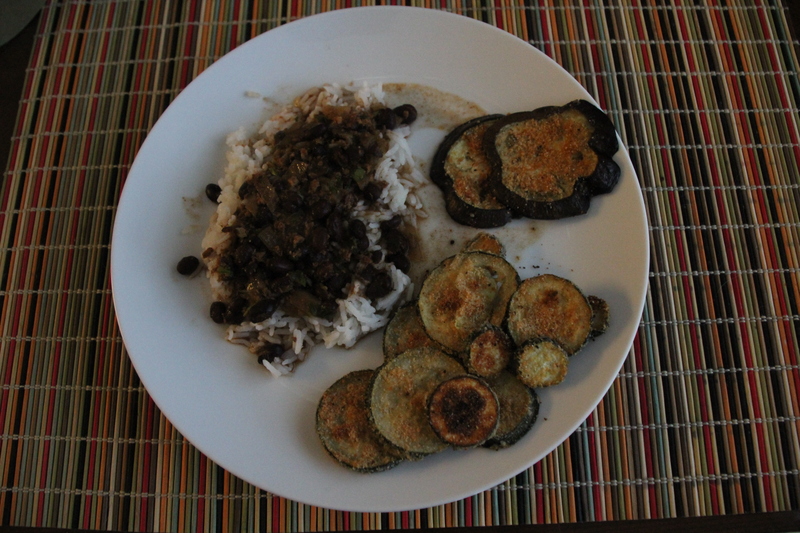 Yep, she gathered the first zucchini and eggplant of the season and I couldn’t wait to cook it up. I had seen several pinned recipes on Pinterest for zucchini chips but none of them were quite what I was looking for. 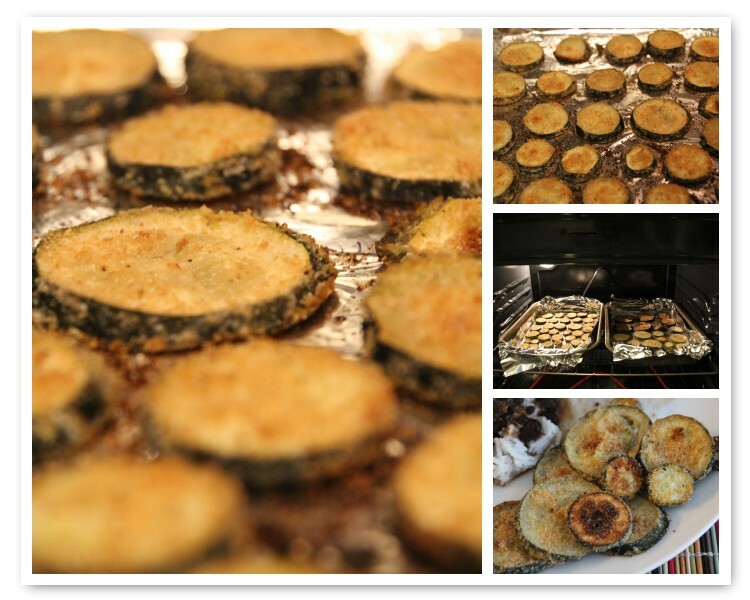 So, I hit up Food Network and found the perfect recipe for Zucchini Parmesan Crisps (Weight Watchers point value = 3). 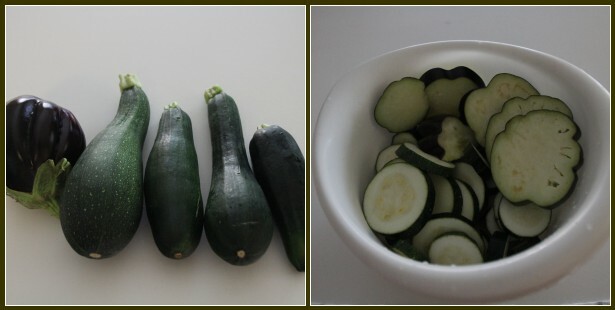 I started by slicing the zucchini (and eggplant) into 1/4″ rounds. I then drizzled the olive oil over the slices and stirred to coat all the pieces. I then mixed up Kraft Parmesan and bread crumbs with salt and pepper. I didn’t have fresh Parmesan on hand, like the recipe calls for, but I will for the next time. As wonderful as this dish was, I can see where the fresh grated cheese would make it even better. I then dredged each piece of the cut up veggies in the dry mixture before placing them on the prepared cooking sheets. In the oven they went while I turned my attention to the other dishes. Several weeks ago my mom and I spent most of a Saturday preparing bags of crock-pot freezer meals (another Pinterest discovery that I still plan to write about). Earlier this afternoon I had placed one of those meals, Hearty Black Bean Soup (Weight Watchers point value = 3), in the crock-pot in preparation for dinner later tonight. 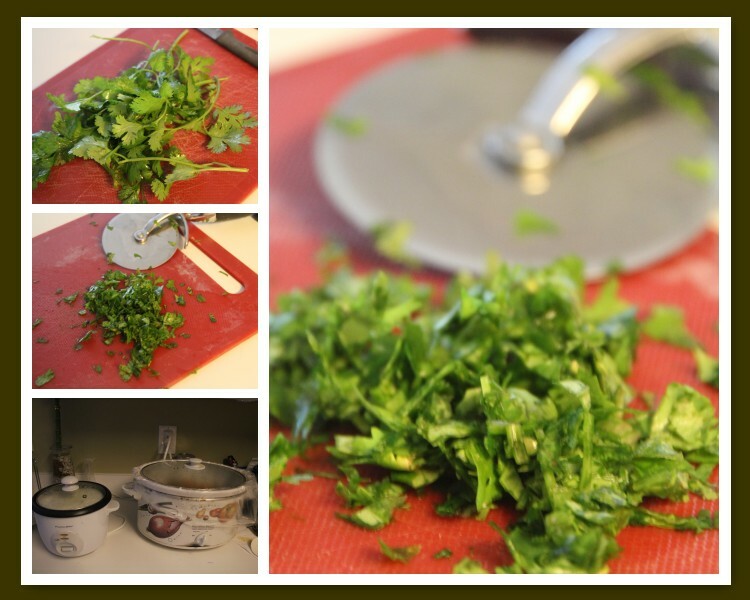 This recipe called for fresh cilantro to be added to the pot about 5 minutes before serving. It just so happened that mom had fresh cilantro growing in one of her container gardens and she gathered up a handful for me. I chopped it up and added it to the crock-pot and started some rice in the rice cooker. After about thirty minutes, the rice, soup and veggies were ready to eat. And so were we! I had a craving for black eyed peas with pepper sauce. Isn’t it strange how these cravings come out of nowhere. Anywho, the peas and corn may have come out of a can but the pepper sauce was homemade with peppers from our friend Jeff’s backyard garden last fall. Let’s just say my craving has been satisfied. Well, at least until I have the leftovers for lunch tomorrow. And for anyone who’s out there helping me count my Weight Watchers points, the total value for this traditional southern meal was only 9 points. Did I say nom nom?!? 149/365 Too Tired to Party? Our day started EXTRA early due to some logistics challenges with having the kiddos on a school night and Gil’s need to get me to work and get himself logged into work for an 8:00 AM training class. Let’s just say that 5:00 AM alarm seems like days ago. I’m beat, whipped, exhausted. After my own 10.5hr day at work I would have normally just begged to go straight home so I could just crash. However, we had ‘plans’ tonight with our neighbors. We were planning to meet for happy hour and dinner without kids and at an actual restaurant. Normally, we just meet in the driveway. Which I LOVE by the way. I’ve never really had that “I actually like my neighbors” experience so when the opportunity came to just go hang out with them, we jumped at the chance. It was fun and I hope we can make this a regular thing. 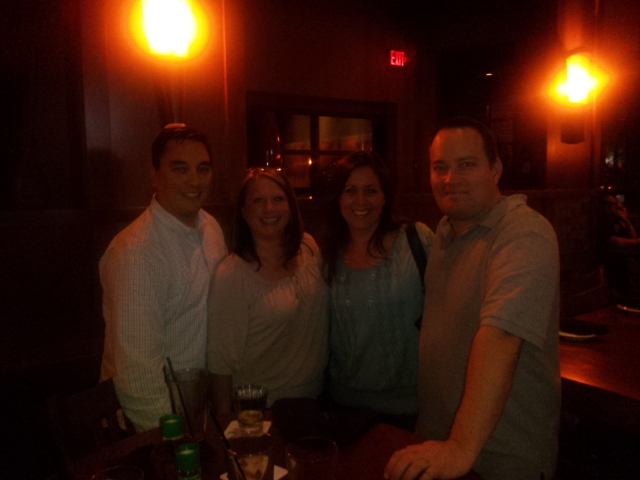 Thanks to Brian Brad and Kathy for a wonderfully relaxing night. I was having so much fun that I completely forgot how tired I am. Don’t you just love Five Guys Burgers and Fries? Don’t you love them even more when the money you spend goes to help a local school? Tonight, we enjoyed some super yummy burgers and fries and helped Danny’s school.